Up to 96 million Americans could live in states that legalized medical marijuana or recreational cannabis this November — but that’s not going to happen if supporters, allies and industry don’t pitch in, experts warned Wednesday. 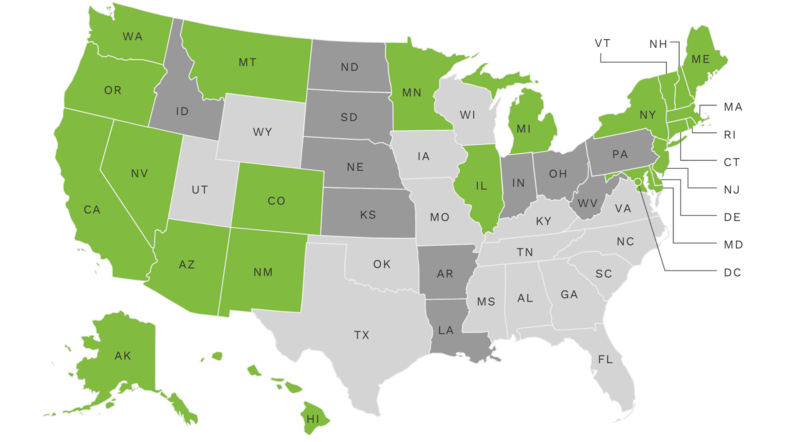 Marijuana law reform efforts in California, Nevada, Arizona, Massachusetts, Maine, Florida, Arkansas, Missouri and Ohio in 2016 are "dangerously over-extended," said Ellen Flenniken, of the Drug Policy Alliance in a webinar Wednesday. "This is what keeps me up at night." A string of 2016 losses "could debilitate us for years," said Drug Policy Alliance's Tamar Todd, in the webinar titled "DPA: California’s path to legalizing cannabis." The webinar was hosted by the pot tech company MJ Freeway. Won't Legalize Itself: Medical and adult-use pot law reform efforts are over-extended nationwide. For California, DPA confirmed the Adult Use of Marijuana Act will gather enough signatures to put the measure on the November ballot. But as the signature deadline looms, AUMA’s proponents are slowing the effort to save money for election advertising and other costs, they said. Drug Policy Alliance, Marijuana Policy Project, and wealthy individuals have donated $3 million for California legalization. It could cost $10 million to run a campaign without opposition, and much more if significant opposition emerges. AUMA's public opposition includes the drug war establishment (cops, prisons, the rehab industry, and some parent groups), as well a few pro-marijuana activists. Meanwhile, the national cannabis industry itself has donated only $25,000 to DPA’s legalization efforts, Todd said. This is in spite of the fact that California medical pot industry alone does an estimated $1.4 billion dollars per year in sales. About 20,000 Californians will be arrested for pot this year, a disproportionate number of them young, male and black, experts state. "California is pivotal" to the nation and the world, Flenniken said. "A win in California would provide political cover to demand the attention of the new President and Congress and bolster efforts around federal legislation to continue rolling back prohibition." The United States has five percent of the world’s population but 25 percent of its prisoners. US law enforcement agencies make 1.5 million drug arrests each year, about half for pot, and blacks are anywhere from two to ten times as likely to be arrested for weed (depending on the jurisdiction) despite similar usage rates as whites. America is "addicted to mass incarceration," she said. Over in Nevada, pot legalization is polling strong, but DPA worries about billionaire prohibition supporter Sheldon Adelson, who lives in Nevada. Adelson could kill legalization with a single donation. "If he was wants to defeat the measure, he has unlimited funding to do so. Time will tell," Flenniken said. Ditto in Florida, where Adelson already denied medical marijuana to the majority of Floridians in the last election cycle by funding an opposition campaign. He could easily do so again in 2016. "We really, really hope he will abstain this cycle," Flenniken said. Legalization in Arizona is like Nevada, with "decent" voter support, but low funding. The prospects of a victory are teetering on the whim of another wealthy prohibitionist, Arizona Diamondbacks owner Ken Kendrick, who could defeat the measure by signing one big check. Kendrick’s wife is already cutting checks to prohibition supporters there. Over in Missouri, voters generally support medical marijuana, but the  campaign is running out of money as the final May 8 deadline approaches to file enough signatures with the state. DPA donated $125,000 in Missouri. "please donate and help them cross the finish line," Flenniken said. Overall, the total cost for victory in every legalization and medical state this election cycle could total $40 - $50 million, DPA said. Past legalization efforts have cost about $1 per voter, and spending at that rate alone would cost reformers $57 million this year. Even if DPA and MPP spent everything they had and closed their offices, "we’re not even halfway to the most conservative estimates," Todd said. "To pull off this groundbreaking victory in November, we need your help." Meanwhile popular radio celebrity Adam Corolla predicted March 18 that California will not legalize cannabis in 2016, because despite the state's liberal reputation, it's an over-regulated nanny state. "On one hand we have this stupid reputation for it being like, 'Come out and do your thing,'" said Corolla. "On the other we have more rules and regulations than any place in the world. It’s not as footloose and fancy-free as you think."